We live in a world surrounded by terrible stuff for us. We poison our bodies with unhealthy foods and improper diets. Most Americans don’t even have regular bowel movements. It’s not a comfortable subject. That’s why it gets ignored by so many. Before you begin any weight loss program, you should cleanse your body so you can absorb nutrients. 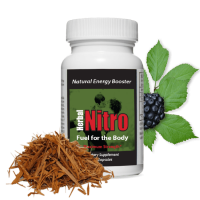 Herbal Nitro can help you with your commitment to better health and weight loss. You feel better and look better when you keep your body cleansed. Your liver must handle all of the impurities that build up in our bodies from alcohol, smoke, preservatives, and pesticides. My Gentle Detox contains herbs that cleanse the colon and botanicals to help support the colon, gall bladder, and kidneys. Absorb nutrients better as you feed your body healthier. Optimize intestinal functions for healthier skin. 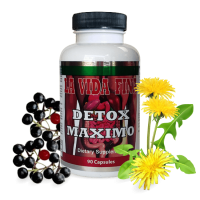 Detox Maximo combines botanicals and herbal extracts to both detox and cleanse the colon. This 90 capsule bottle has a bilingual label (Spanish/English). Sounds too simple, but it is true. Drinking the proper amount of water is one of the most important things you can do to improve your health and weight. Your body is approximately two thirds water. Your body needs plenty of water to operate properly. Water is essential to transport oxygen to your blood. Water transports nutrients through your blood. Water flushes out impurities and excess salt. Water helps regulate your body temperature. Water helps burn fat. Without water, your kidneys can’t do their job, and the liver has to help them. If your liver is helping your kidneys its not burning as much fat, so more fat gets stored in your body. Water helps regulate your appetite. Thirst is often mistaken for hunger and that’s a real diet-blower. Drink more water to lose water weight! It sounds weird but to overcome water retention you need to drink more water. It’s true. 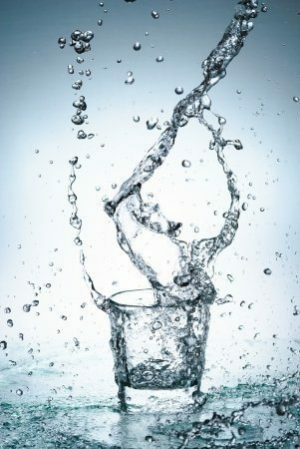 If your body thinks dehydration is possible, it holds onto the water in your body; storing water between the cells. This causes swelling. When your body is hydrated, it naturally releases stored water. Mild dehydration is a common cause for fatigue. Even a minor drop in body water can affect concentration. To maximize your health and weight loss results, be sure to drink plenty of water when you use Herbal Nitro Dietary Supplements. Drinking water is simple, critically important, and virtually free! You want to lose weight, but can’t be bothered with counting every single calorie. You can still make a positive impact on your diet and weight by thinking in 100 calorie increments. If you consume more calories than you burn – you GAIN weight. But the reverse is also true: Burn more calories than you consume to LOSE weight. Extreme Energy and Fuel for the Body help boost your energy, helping you stay more active and burn more fat and calories! However, if you need to help curb your appetite and boost your fat burning then Allura Trim Stick Pack is the perfect herbal weight loss supplement to help you stick to your plan! In addition to helping control appetite, the special herbal formula helps give you a gentle energy lift. While we need all the help we can get when losing weight, you should not take Allura Trim with Extreme Energy or Fuel for the Body. It takes 3500 calories to produce one pound of body weight. Just drop 100 calories per day and you could lose 10 pounds in a year! It’s not that hard to cut 100 calories. Here are some ideas. Choose sugar free over regular ice cream. Choose low fat turkey sausage instead of regular sausage. Choose non fat milk rather than whole milk. Substitute 4 egg whites for 2 whole eggs. Drink diet soda instead of soda with sugar if you must have a soda. Top your chips with salsa instead of nacho cheese. Top crepes or pancakes with fruit instead of syrup and butter. Choose broth based soups over cream based soups. Pick soft tacos rather than hard fried tacos. Eat steamed rice instead of fried rice. Roast or grill meats instead of frying. Buy water-packed tuna instead of tuna packed in oil. Can’t resist a slice of pie? Just don’t eat the crust. Use only half the butter called for in boxed side dishes such as macaroni and cheese. Order salad dressing on the side. Dip your fork in the dressing, then the salad. You get dressing taste in every bite and will eat less dressing. Enjoy a lite beer or wine spritzer instead of fruit juice based alcoholic beverages. When you eat out put half of your meal in a to-go box before you begin eating. Herbal Nitro products can help curb your appetite and resist those pesky calories! *Calories shown are approximates and may vary with brand and variety. When you think exercise, it doesn’t all have to be aerobic work-outs or Zumba classes at the gym. Those are great but not always possible. That’s still no excuse, check out these activities. Washing the car – Saves money too! *Factors such as body weight, gender, age, and intensity influence the actual amount of calories burned.